Merion. To all true golfers, the name conjures up stirring images. Merion's East Course, always on everyone's list of favorites, is a traditional golf club where history has been made time and time again. There's no doubt that the gods of golf have smiled on Merion. The Club was founded at just the right moment in time when the game was in its infancy in this country. It was founded in a marvelously right location, where sports-minded men and women have always abounded. And it had the right golf course architect, Hugh Wilson, a gifted amateur whose maiden effort, according to USGA president Richard S. Tufts, was a "model test of golfing skill and judgment for future architects to copy." There are no records of Wilson taking a trip abroad prior to the spring of 1912. However, that year he spent several weeks in the British Isles. No itinerary exist, and he eventually canceled his Titanic passage to remain for a few additional days. His time in the Isles confirmed the wisdom of the East Course's routing and the eventual deceptive bunkering. The wicker baskets' origin is a mystery to this day. There was a great deal written in 1912, and for three years thereafter, locally and nationally about this new course in Philadelphia. However, there was no mention of the soon-to-be famous wicker baskets. It could be assumed they were not there. By the summer of 1915, William Flynn, Merion's Superintendent, received patent approval for his wicker basket design. Merion had baskets that fall and from then-to-today. It could be assumed, due to lack of written proof, that Flynn convinced Wilson to use the baskets, and Merion received its "basket notoriety" the next year during the 1916 U.S. Amateur. 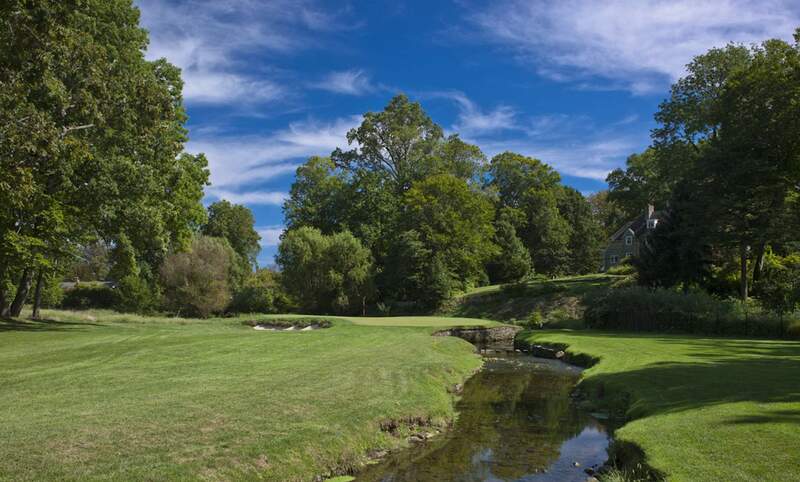 On September 12, 1912, the old course at Haverford was officially closed, although used for another year, and on the 14th, the new course and the clubhouse were opened to members. A report of the opening said the course was "among experts, considered the finest inland links in the country." This was an assessment that has been echoed down through the years. The current condition of the course is constantly compared to early photographs, and every effort is made to ensure that people playing the course today compete on the same course as did the champions of old. For that reason, also, the course is maintained as though to hold championships daily. There is always an intermediate rough. The dunes grass and Scotch broom are other Merion traditions, as is the way that bunkers are maintained with peninsulas, islands of grass and "eyebrows. Traditions at Merion are concerned with the playing of the game. No mulligans are permitted at the first tee. Players and caddies alike are expected to respect the course, and others on the course, by leaving each hole better than the way they found it — replacing divots, raking bunkers and fixing pitch marks — and by leaving it quickly. Slow play earns a reprimand at Merion. All in all, Merion is about golf. It honors history and the continuing values of the game. The grand old course made its debut in national competition when it hosted the 1916 U.S. Amateur. The 1916 Championship also marked the first national appearance of Robert T. "Bobby" Jones, Jr., then 14 years old, who went on to win his first National Amateur at Merion in 1924. Jones closed his international career winning the 1930 U.S. Amateur on Merion's eleventh hole. This was his fourth major win of the year (U.S. and British Amateurs and Opens) completing the never-equaled Grand Slam. Merion continues to make golf history to the present day. Georgianna Bishop, Bill Campbell, Dorothy Campbell, Gary Cowan, Olin Dutra, Chick Evans, David Graham, Leigh Anne Hardin, Ben Hogan, Bobby Jones, Lloyd Mangrum, Buddy Marucci, Phil Mickelson, Cary Middlecoff, Johnny Miller, Edoardo Molinari, Jack Nicklaus, Arnold Palmer, Chris Patton, Gary Player, Mrs. Mark Porter, Jay Sigel, Sam Snead, Mrs. Henry Stetson, Lee Trevino, Tom Watson, Tiger Woods, Justin Rose — Merion has known them all.